The Rockport Film Review: "Apartment 1303" Asian Horror Worthy of an American Re-make? 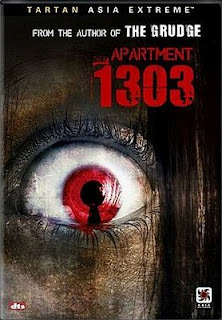 "Apartment 1303" Asian Horror Worthy of an American Re-make? Starting about ten years ago an explosion of Asian horror movies made their way to the United States and many have been remade. "The Ring" and "The Grudge" being the most popular of the dozen or so remakes. The Japanese movie "Apartment 1303" was released in 2007 and is now being remade with Mischa Barton starring. The remake has yet to be released and like most movies, these days is in 3D. Sayaka is a young woman who gets a deal on her first apartment. So she throws a party to celebrate. She then unexpectedly jumps off the balcony to her death in front of everybody. Her sister Mariko is convinced that it wasn't a suicide and starts her own investigation. The girls' mother is so grief-stricken that her favorite daughter has died she spirals into madness. Like a lot of J-Horror films, "Apartment 1303" relies a lot of atmosphere, suspense, and creepiness. Mariko finds out that her sister is the fifth young woman to have jumped of the balcony and starts to see the ghosts of the mother and daughter who haunt the place. The backstory and origins of the curse are revealed and all of the horrible things that have happened there. The story is heavily structured and planned out, but is quite an enjoyable watch for the casual horror fan. This movie is apart of the Tartan Asian Extreme DVD series. Add it to your Netflix queue today.